Plotting a course for Canada’s Maritime Providence in summertime yields many rewards. 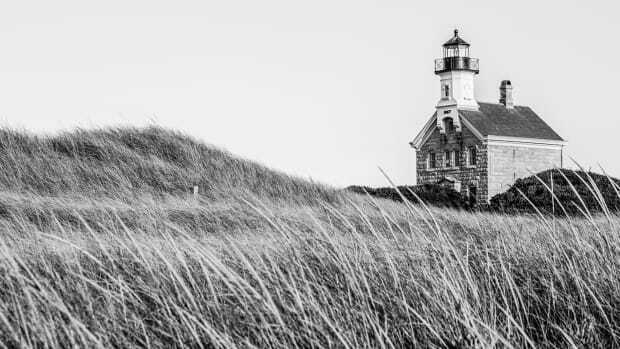 The author plots a course to Nova Scotia and discovers his adventurous spirit all over again. We strolled down to the waterfront after dinner. It was a cool summer evening as we sat on the end of the pier, overlooking a moonlit Bras d’Or Lake. My girlfriend had a puzzled look on her face when I suddenly asked if she would be willing to continue this adventure. I knew she was up for one: After all, she had agreed to pack what little she could into a single saddlebag and join me on a two-week motorcycle ride from Baltimore to Nova Scotia. Not knowing what would betide, I risked the question anyway. When I pulled the ring out of my pocket and her puzzled look changed into a bright smile, I knew the answer—the motorcycle adventure we were on was only the beginning. Now, here we are, 20 years later, sitting on that same pier in the little village of Baddeck, in Cape Breton, Nova Scotia, this time having arrived by boat. From the day we met, my wife Dori and I knew we shared the same enthusiasm to live life to the fullest. That quest led us through a series of boats, to building Liberdade, our 54-foot Ocean Alexander trawler on which we’ve cruised extensively for the past four years. Winters find us in Florida or the Bahamas, and summers in North Carolina or the Chesapeake Bay. Each spring we’ve thought of traveling farther north, but other responsibilities kept it from happening. Last spring we found a window of opportunity, so in April we continued on. Our destination? Back to where the adventure began: Nova Scotia. The Canadian province holds a special place in our hearts, and not just because it’s where we were engaged, but because Nova Scotia is as much a feeling to experience as it is a place to see. Our first, albeit brief, visit there had stayed with us for 20 years. We were now looking forward to exploring its treasures over a summer of cruising. 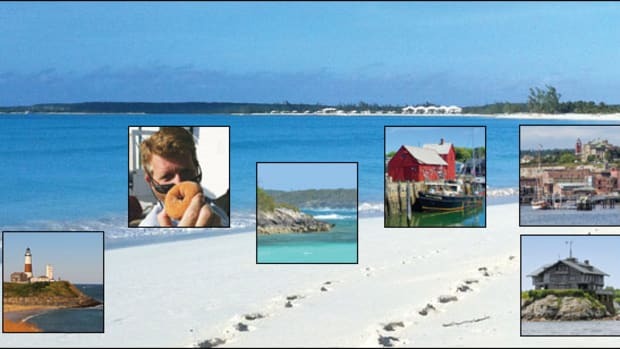 The trip was going to be even more enjoyable, because our good friends Bruno and Beatrice—who we’d met in the Bahamas a few seasons ago—agreed to join us aboard their 76-foot Nordhavn Trixie. 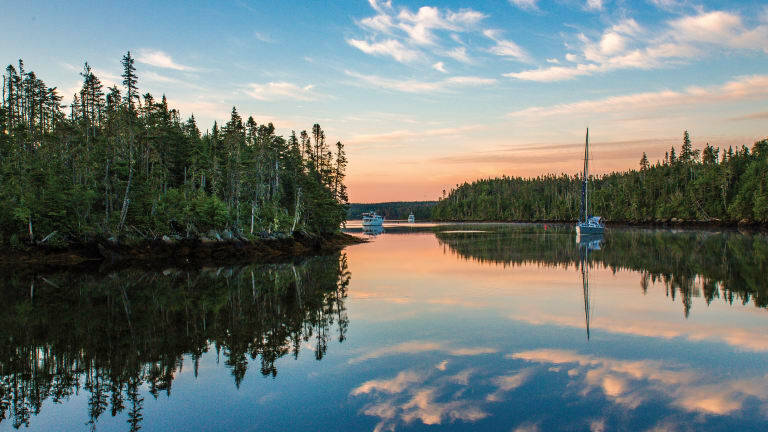 Nova Scotia is the second smallest Canadian province, but to the seafaring folk who live there, and visiting boaters, it feels much larger. While commonly thought of as an island, it’s actually comprised of a peninsula attached to New Brunswick at the Isthmus of Chignecto and Cape Breton Island. 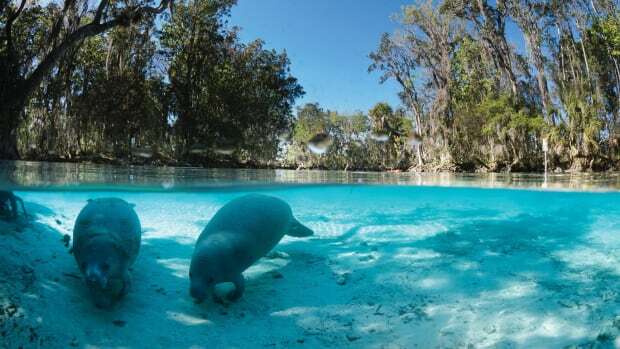 At 360 miles long and an average of 80 miles wide, the length could be driven in a day or the width in an afternoon, but it would take a lifetime of summers to visit all of its bays and coves by boat. 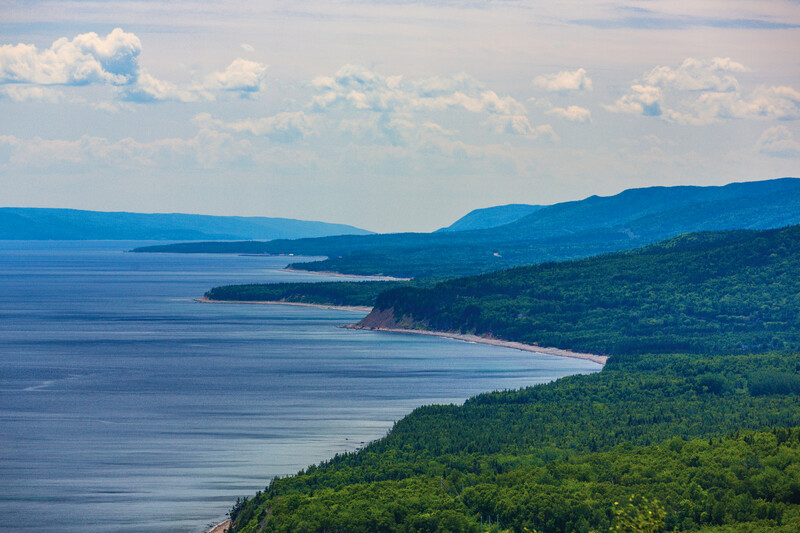 Canada has more shoreline than any country in the world, and Nova Scotia has the longest shoreline relative to its land area of any province in Canada. Planning a route from Maine to Nova Scotia comes with challenges unique to the area. 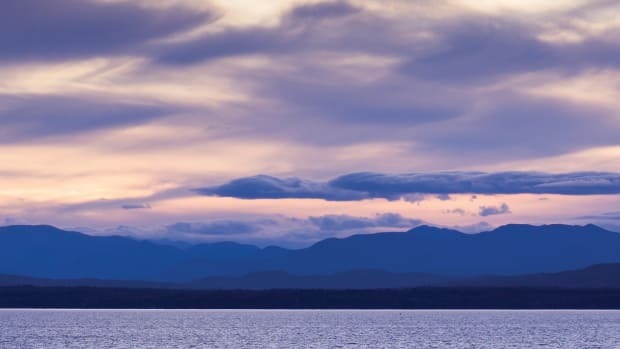 There are two commonly used points of entry for a small boat arriving into Nova Scotia—Yarmouth on the southern end of the peninsula or Shelburne on the southeast Atlantic coast. There are pros and cons for arriving by either one. 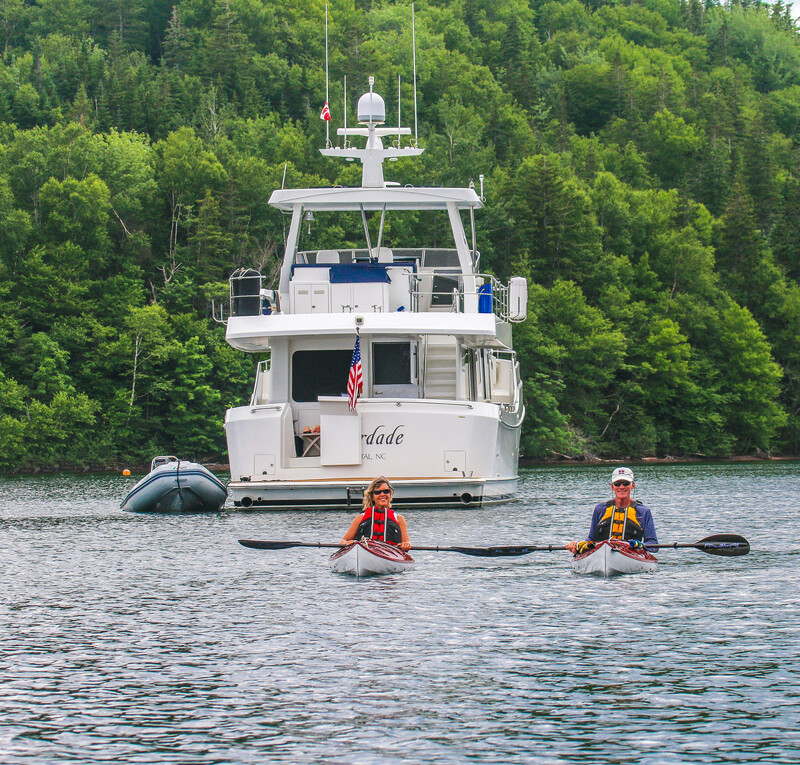 Yarmouth can be reached within the daylight hours of a long summer day, but to move on from there boaters have to deal with the tidal current from the Bay of Fundy—home to the world’s highest tides—and intersecting Labrador Current at Cape Sable. 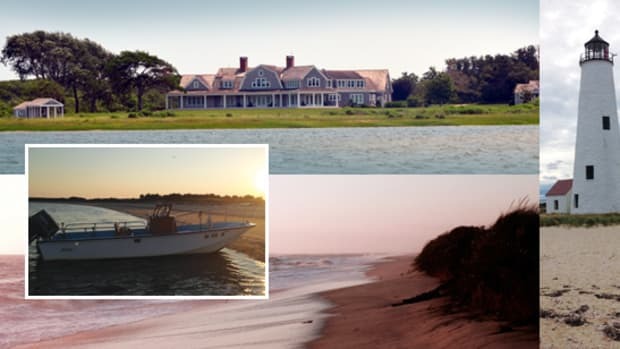 Arriving in Shelburne allows for a more southerly approach, slightly less influenced by the bay’s currents and associated tide rips north of Cape Sable. However, this route is an overnight passage for a displacement speed trawler. We decided to clear into Shelburne, so our departure and arrival time needed to be very specific. At our cruise speed of 8 knots, the crossing would take 22 hours. 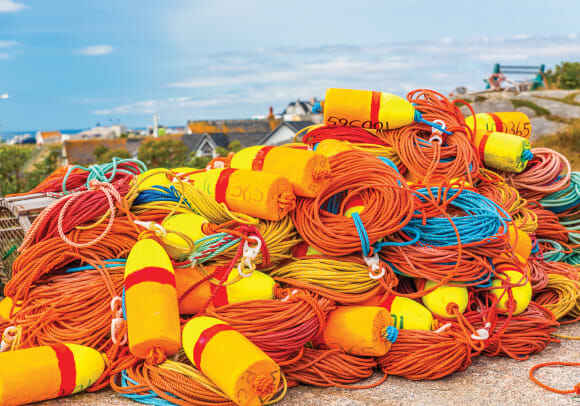 All of New England and the Canadian Maritimes are lobster territory, with lobster pot buoys seemingly blanketing the sea surface, just waiting to snare the inattentive boater. We would be lobster-pot free once we cleared Maine waters; Nova Scotia’s lobster fishery closes from May 31 through early November. This meant if we left Maine early enough in the afternoon we would stay in daylight until we passed the last pots. We were relieved and surprised to be passing the last pots at dusk—in over 500 feet of water, no less. Timing of the afternoon departure also had to coincide with a specific arrival time at Cape Sable. While we would be south of the heaviest tidal flow coming out of the Bay of Fundy, we still wanted to catch the current going with us around Cape Sable the following morning. Boats rest “high and dry” at Hall’s Harbour on the low end of a 24-foot tide swing. Just 3 hours later, Hall’s Harbour is at mid tide. July 1 found Liberdade and Trixie moored in Southwest Harbor, Maine waiting for a suitable weather window to cross the Gulf of Maine. Unfortunately that would not come until a week later on July 7. The wait rewarded us with one of the most spectacular 4th of July fireworks displays we have ever seen. Our weather router, Chris Parker, finally gave us a 22-hour forecast we found acceptable, so on the afternoon of July 7, Liberdade followed Trixie through the beautiful Cranberry Isles into a slightly choppy but sunny Gulf of Maine. The next 22 hours were blissfully uneventful. 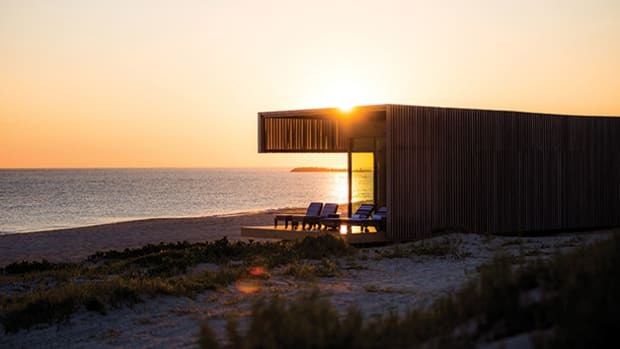 When the sun rose over the North Atlantic Ocean, with Cape Sable Island to port and the mist of a whale spout blown into the morning air to starboard, we knew our zest for adventure was alive and well. The town of Shelburne, our chosen port of entry, is located on a natural harbor cut deep into Nova Scotia’s southeast coast. It is one of the most well-protected harbors along this windswept shoreline. We would appreciate that in the coming days as our patience would continue to be tested. Shelburne has been welcoming visiting boats from around the world for over 300 years. Valued by the indigenous Mi’kmaq, the French and English, it has protected and sustained different cultures and people. Today it is considered an historical settlement, with a healthy economy and easy pace of life. Our plan was to clear Canadian customs and immigration through the approved Shelburne Harbour Yacht Club and enjoy the village for a few days before continuing on. We ended up moored there for seven days while Tropical Storm Chris made a carom shot off the Maritimes and headed out to sea. The wait was a blessing though, reminding us Nova Scotia was not someplace to rush through. The time in Shelburne gave us a chance to explore the town more deeply and to lay out an itinerary for the following weeks, keeping in mind that boating plans are always written in the sand. During the wait, the knowledge generously shared by local boaters proved to be invaluable. Dori and I enjoy the boating life for a host of reasons. 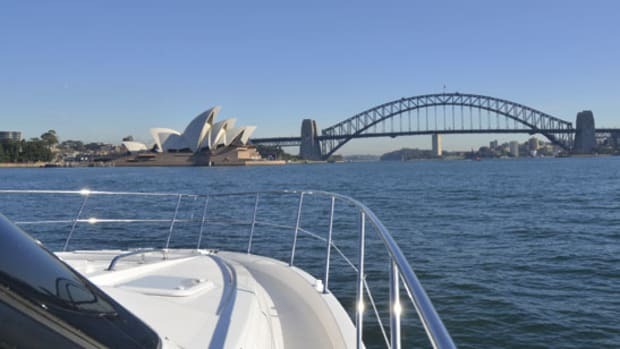 Very few activities present the challenges and rewards of safely navigating a boat over long distances. But it’s not just running the boat: It’s as much, or more, the unique experience of arriving someplace by water. “Yes,” we answer when speaking to a marina, “we are looking for the transient moorings.” The word “transient” can be descriptive, referring to something that is happening only briefly. I like the definition used in astrophysics the best: “A transient event is a short-lived burst of energy in a system caused by a sudden change of state.” This is the life we have chosen to live as long-distance cruisers. We are a transient event, arriving in each new port of call in a short-lived burst of energy. To experience this feeling in a land as enchanting as Nova Scotia is unparalleled. The briefness of a transient’s visit to a new port brings with it an intensity unlike any other. 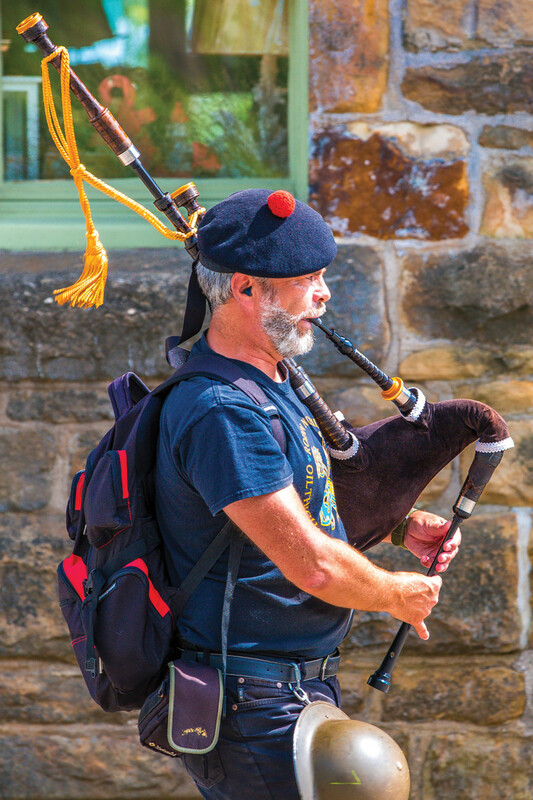 Cape Breton’s lush green shoreline and Celtic music make cruisers feel like they transported to the other side of the Atlantic. Knowing our time is limited, we dive in, tasting and experiencing everything the destination has to offer. Historic villages like Lunenburg on Nova Scotia’s Atlantic coast are a good example; it offers an intoxicating mix of pleasures to sample. Brightly colored houses lining the hillsides above the waterfront beckon visiting boaters to come ashore. Unwilling to become a storefront tourist image of a once-vibrant waterfront economy, Lunenburg has maintained a working waterfront of craftsmen, fishermen and merchants. Lunenburg is one of only two urban communities in all of North America designated as a UNESCO World Heritage site; it is also regarded as one of the best examples of an 18th century British colonial settlement. Boating can be a very social activity. 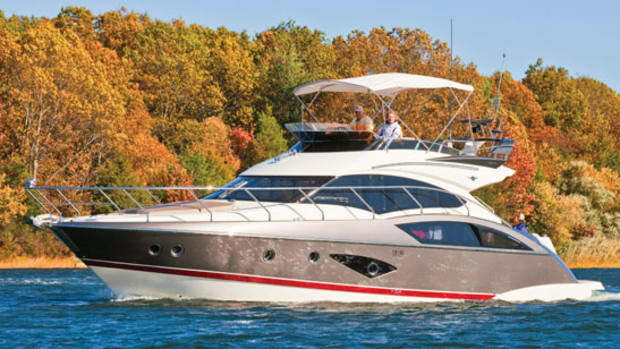 It’s not unusual to make new friends along the way, or find like-minded people to cruise with. While we treasure the friendships we’ve made in our years aboard, up until this trip, we’ve resisted making plans to spend long periods in the company of another boat. Something in us bristled at the thought of being restricted or influenced by others. We found a solution: The crews of Liberdade and Trixie agreed at the beginning of this trip that there would be no restrictions placed on each other. We would cruise together for as long and as frequently as it worked out, and we would part company as friends when it did not. We had learned beforehand there could be a group of trawlers heading to Nova Scotia around the same time as us. The group was loosely organized by Milt Baker, founder and former owner of Bluewater Books & Charts in Ft. Lauderdale, and an active world cruiser. 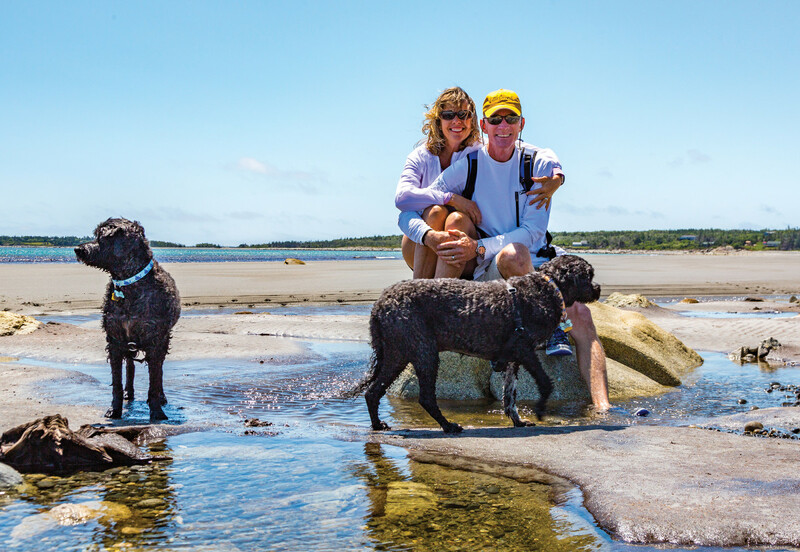 Milt and his wife Judy have generously shared their boating knowledge of New England and Nova Scotia with fellow boaters, encouraging them to experience the area. We met this group briefly in Lunenburg and found we were all heading north toward the jewel of Cape Breton—Bras d’Or Lake. Our trip to Nova Scotia was enhanced by time spent with our friends Bruno and Beatrice aboard Trixie, as well as the new friendships we made. Cruising with friends wasn’t so bad after all. Bras d’Or is called a lake but is actually an inland sea. Contained within Cape Breton Island, which makes up the eastern third of Nova Scotia, Bras d’Or is a brackish body of water, open to the ocean to the north and controlled by a lock at St. Peter’s to the south. Canadian author and yachtsman Silver Donald Cameron describes Bras d’Or Lake as “A basin ringed by indigo hills laced with marble, and islands within a sea inside an island.” With over 400 square miles of protected water and almost 700 miles of shoreline, it is a boater’s paradise. We locked through the canal at St. Peter’s on a rainy mid-July day and made our way to the St. Peter’s Marina to plan our next month in the Lake. It would be impossible to sample all of the Lake’s anchorages in such a short time, so we carefully chose a few. Our longest stay in the Lake was in the village of Baddeck. 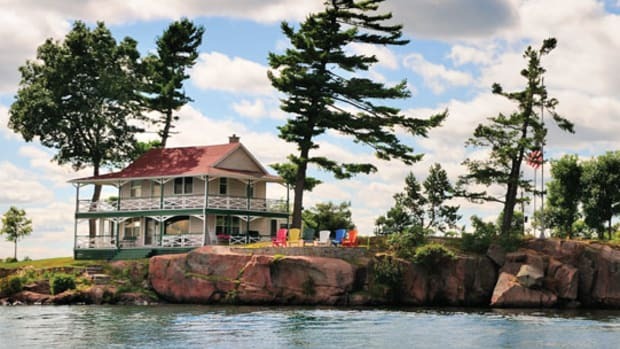 Of course, Baddeck is dear to our hearts for our personal history there, but the charming village is also full of the friendliest people one could ever want to meet. We were happy to find it had changed little in 20 years. We were also fortunate to be there during the 100th anniversary of the Bras d’Or Yacht Club’s Annual Regatta Week and the Annual Baddeck Summer Street Festival. The Festival is a great stage for local musicians—Nova Scotia, and Cape Breton in particular, is home to many talented singers and songwriters. The village displayed the best it has to offer during these popular annual events. Having reached our farthest point north and confirming she would, in fact, say “yes” again, we reluctantly left Bras d’Or to begin our journey back. With stops planned along the coast at Isaac’s Harbour and Liscombe Lodge, we set a course for Halifax, a world-class city by any measure. Halifax’s economy and vibrance is largely due to its successful shipping business. The Port of Halifax is one of the deepest, widest, natural ice-free harbors in the world, second only to Sydney, Australia. The city’s international seafaring tradition is kept alive in an active cosmopolitan waterfront and its highly acclaimed maritime museum. From our location safely moored at the Royal Nova Scotia Yacht Club, we filled 10 days in Halifax, getting to know all we could about its history and culture. 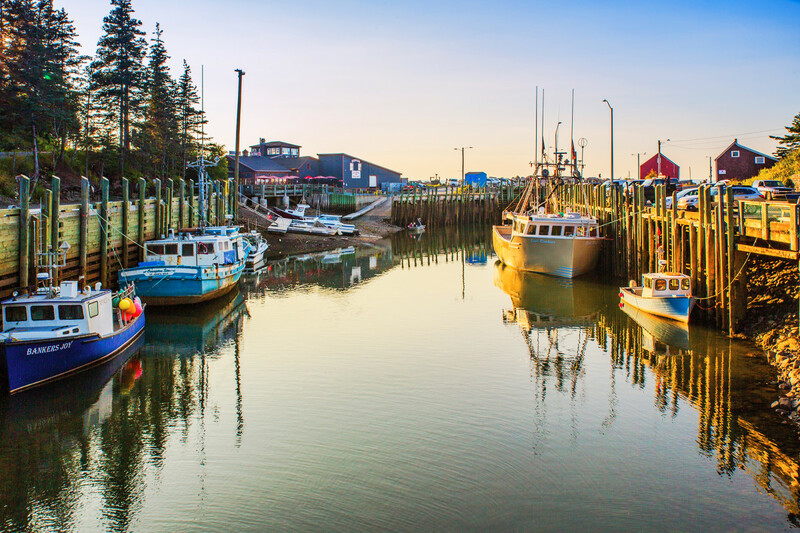 With its central location, it’s also a great starting point for day trips by land to nearby attractions like Peggy’s Cove or the Annapolis Valley. Summer was drawing to a close in the northern latitudes, and we wanted to enjoy some of the fall season in New England, so Halifax would also be our port of departure out of Canada. Again we waited for a suitable weather window. When a marginal forecast finally opened, two Nordhavns we met in Cape Breton, Gratitude and April K, joined us for a lumpy but successful 34-hour run back to Southeast Harbor. 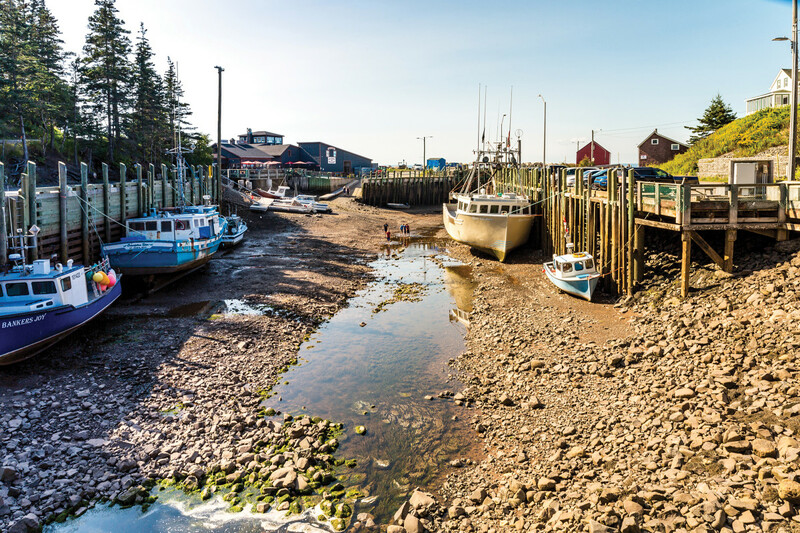 Nova Scotia will always be a part of us, with enduring memories of its vibrant seaside villages, rugged natural beauty and a lifetime’s worth of ephemeral escapades.